The 1873-74 city directory gave great credit to the banks for the growth of the community. aid in every commercial interest. The first bank to begin operations in Iowa was the MINERS' BANK. Controversial from almost its beginning, the bank was investigated by a legislative committee including Warner LEWIS in February 1838, and found to be solvent. The bank's suspension of specie payments led to a second investigation in 1842. A bill for repealing the bank's charter was eventually passed; the Miner's Bank was closed in 1844. The Miner's Bank, like others at the time, began business on an unsound basis. Stockholders paid for their stock with personal notes instead of money. One investor, a Mr. St. John who lived in St. Louis, purchased $40,000 in stock on his personal note and then borrowed $57,000. Before he had repaid any of the money, St. John filed for bankruptcy with the entire loss left to the bank. In 1851 a private bank was organized by Mordecai MOBLEY. Rumors about the bank's solvency led to a frenzy of withdrawals in 1857. Concern was not quieted by forty of the community's wealthiest citizens pledging their financial backing to the bank. The Mobley bank closed in December 1857. The bank briefly reopened in 1858 before closing permanently. Co. and Babbage & Co. Between 1849 and 1863 various other private banks were established in Dubuque. These included Finley, Burton, and Company (1849-1856); Langworthy Brothers (1851-1857); Jesup and Stimson (1849-1857); Sergant, Borney, and Cook (1849-1857); Cook, Sergant and Company (1851-1853); W. J. Barney and Company (1853-1857); H. W. Markell (1855-1863), Herron Brothers (1854-1857), and LUMBERMEN'S BANK. The State Bank of Iowa with F. B. Goodrich as president operated from 1857 to 1863 when it was merged with the FIRST NATIONAL BANK OF DUBUQUE. generally succeed in what they undertake. First National, capitalized with $300,000, was the first Dubuque bank to operate under national banking laws established on January 20, 1864. Franklin HINDS was elected president and M. Kingman, cashier. Hinds was succeeded by R. E. GRAVES and, in 1870, by D. N. COOLEY. The GERMAN SAVINGS BANK was established in 1864 with capital of $150,000. John H. THEDINGA served as the bank's first president. The Merchants National Bank was opened in 1865 and successfully weathered several financial panics. Its directors, including William Boyd ALLISON and John T. HANCOCK, were among the city's most influential business and political leaders. The bank closed as a result of a large embezzlement by Richard A. BABBAGE. Fear caused by the closing touched off the Panic of September 1873. In 1871 the Commercial National Bank of Dubuque was organized with officers including R. E. GRAVES, president; Henry L. STOUT, vice-president; and H. M. Kingman, cashier. The bank closed on March 20, 1888, and eventually paid seventy cents on the dollar to depositors. The SECOND NATIONAL BANK of Dubuque opened for business on May 15, 1876. Its officers were William L. BRADLEY, Jr., president; William F. Large, vice-president; and Gilbert Smock, cashier. Business was accomplished with two clerks. Second National operated the DUBUQUE SAVINGS BANK as a separate organization for many years before consolidating. In 1887 the GERMAN TRUST AND SAVINGS BANK was incorporated by such business and civic leaders as Peter KLAUER, John BELL, and Nicholas GLAB. The bank's name was changed to the UNION TRUST AND SAVINGS BANK in 1917. The bank closed before 1933. The second oldest bank still in operation in Dubuque was opened in 1905 as the GERMAN AMERICAN SAVINGS BANK. Patriotism led the name to be changed in 1917 to AMERICAN TRUST AND SAVINGS BANK. The approach of the GREAT DEPRESSION was felt strongly in the Dubuque banking community. Served by six banks as the 1930s began, Dubuque saw the Federal Bank and Trust Company and the Union Trust and Savings Bank close first. 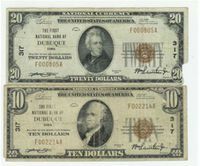 These were followed by the Iowa Trust and Savings Bank and the CONSOLIDATED NATIONAL BANK. American Trust and Savings Bank remained open with infusions of funds from the DUBUQUE FIRE AND MARINE INSURANCE COMPANY. Conservative investments and large commercial accounts kept First National Bank operating. In an effort to inspire Dubuque residents to remain calm, MAYOR Martin B. Andelfinger proclaimed Inauguration Day, March 4, 1933, as "Confidence Day" in Dubuque. A parade was planned. News, however, that New York and Illinois banks had been ordered closed made the festivities seem pointless. At 11:00 a.m., March 2, 1933, both remaining banks announced that they would open for only one hour on March 4 and then only to provide limited service to commercial customers. American Trust observed the bank holiday ordered by the state. First National tried to reopen, but closed when state officials threatened to order militia to enforce the closing. DUBUQUE BANK AND TRUST COMPANY was organized on July 17, 1935. This page last modified 9 May 2017.